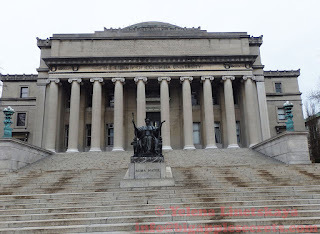 Columbia University is a private Ivy League research university in Upper Manhattan. 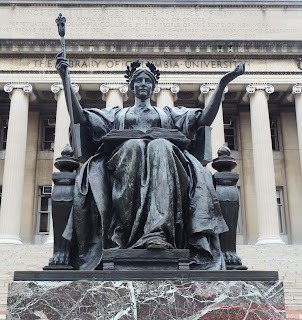 Founded in 1754 as King's College by royal charter, Columbia university is the oldest institution of higher education in the State of New York. 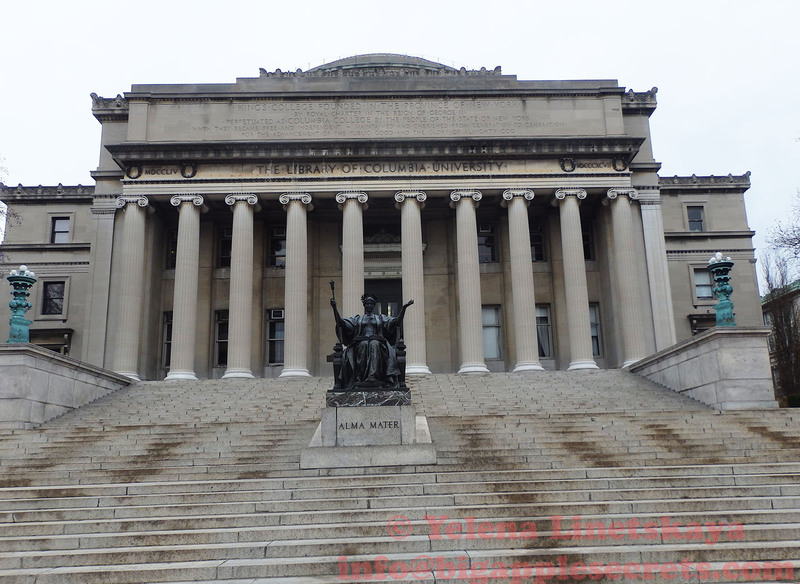 Campus of Columbia University is one of the most beautiful and pleasant places in the city. The campus is beautifully maintained and the buildings are stately. Located in the center of campus is the statue of Alma Mater - latin for "nourishing mother". The source of the current use of the phrase "Alma Mater" is the motto Alma Mater Studiorum ("nurturing mother of studies") of the oldest university in the Western world in continuous operation - the University of Bologna, founded in 1088 ( from Wikipedia). Its first academic usage in English came in the 17th century to describe British universities, and the term is now used by many schools across the English-speaking world. The ancient Roman world had many statues of the Alma Mater, some still existent. Modern sculptures are found in prominent locations on several American university campuses. One of them is in the campus of Columbia University. Holding the scepter of wisdom, the words below "Alma Mater" reference verses: "Wherefore laying aside all malice, and all guile, and hypocrisies, and envies and all slander, as new born babes, desire the sincere milk of the word, that ye may grow thereby." Above "Alma Mater" is a portion of Psalm 36:9, "By your light do we see." Robert Goelet was an American heir, businessman and yachtsman from New York City during the Gilded Age. He graduated Columbia University in 1860. Robert died in 1899 and his wife Harriette commissioned Daniel Chester French, one of America's leading sculptors, to make a memorial to her husband. French earned commissions for marble allegorical groups for new government buildings in Saint Louis , Philadelphia and Boston. Lincoln Memorial in Washington, D.C is his best known sculpture. There are several other statues by French in New York: monuments "Brooklyn" and "Manhattan" at the Brooklyn Museum and "Continents," consisting of four separate statues titled, "Asia," "America," "Europe" and "Africa", located at the Alexander Hamilton U.S. Custom House, now The National Museum of the American Indian. "Alma Mater" sits in a chair, arms stretched upward. In her right hand is a scepter which ends in four heads of wheat which hold a crown. The chair arms each have a lamp which symbolizes Sapientia (Wisdom) and Doctrina (Teaching). An open Bible rests her lap. The face of the statue is really beautiful. The model may have been Mary Lawton, an actress and friend of French's. There is a secret concealed in the statue. There is an owl hidden in the folds of Alma Mater's robes. According to legend, the first student of each College class to find the owl would graduate Valedictorian and marry a girl from Barnard college. 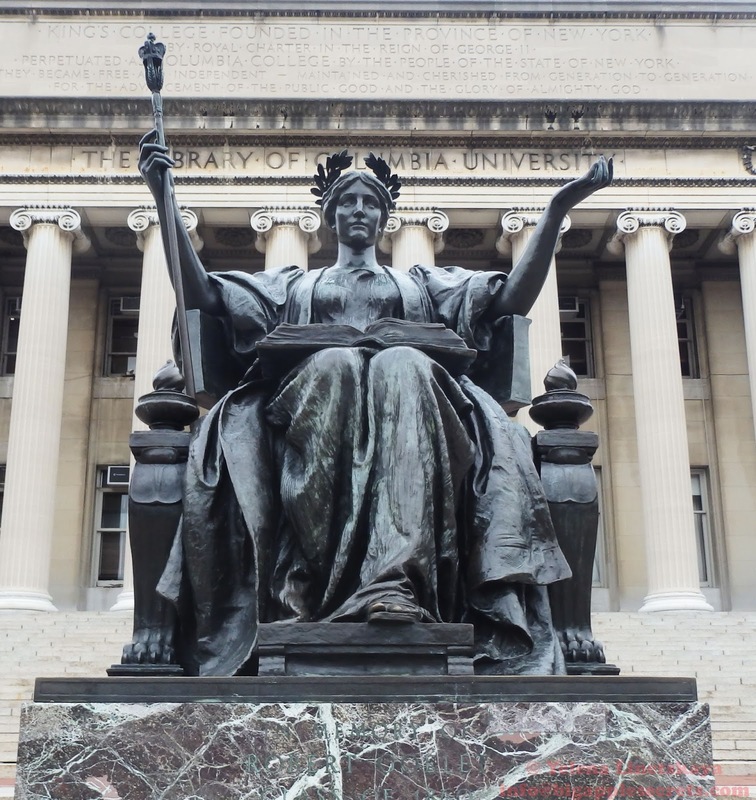 The legend is really old- at that time only men were allowed to attend Columbia university. Barnard college was a private women's liberal arts college, founded in 1889 with a campus next door to Columbia university. In 1900 Barnard college was affiliated with Columbia university, but all the classes before the Class of 1983 were admitted as all-male! Columbia was the last of the Ivy League schools to go coed. 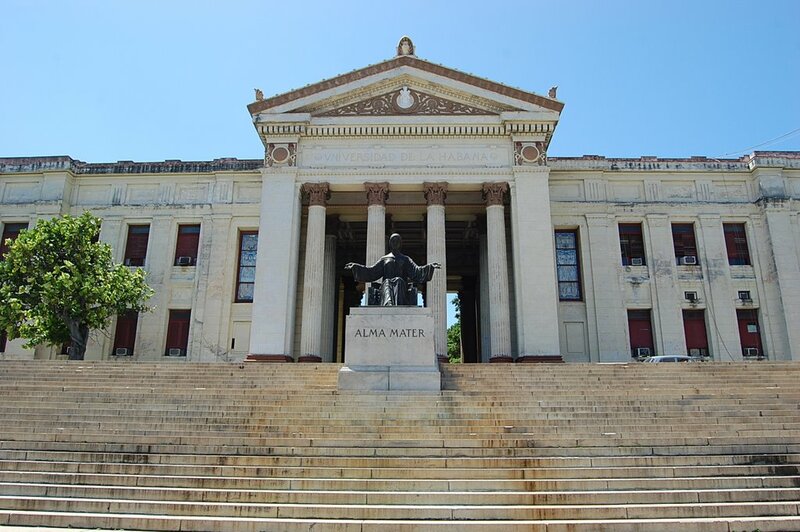 Alma Mater sculpture in Havana, Cuba on the steps of the entrance to the Universidad de La Habana, Cuba was inspired by the statue in New York. 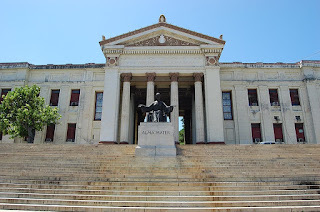 The statue in Havana was installed in its current location in 1927.